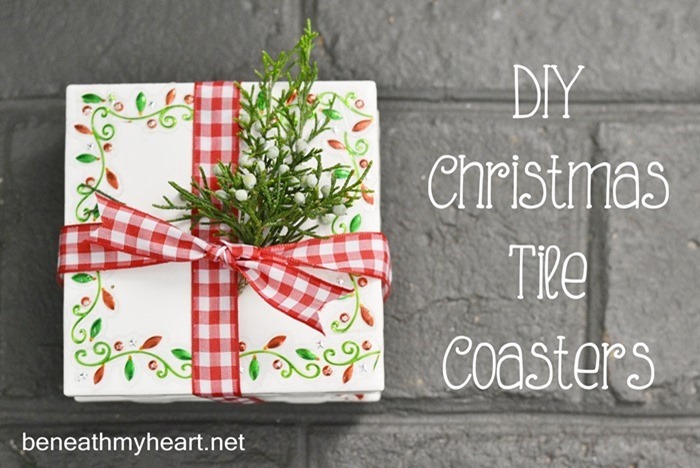 Well, I still love this project because it is so inexpensive and so cute. So I decided to create a new look for my old project. 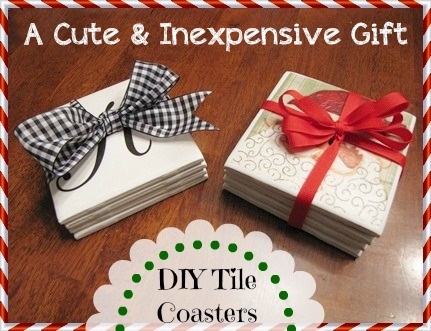 I went to Lowe’s and bought some 4×4 white tiles and some felt pads for the bottom of the coasters. 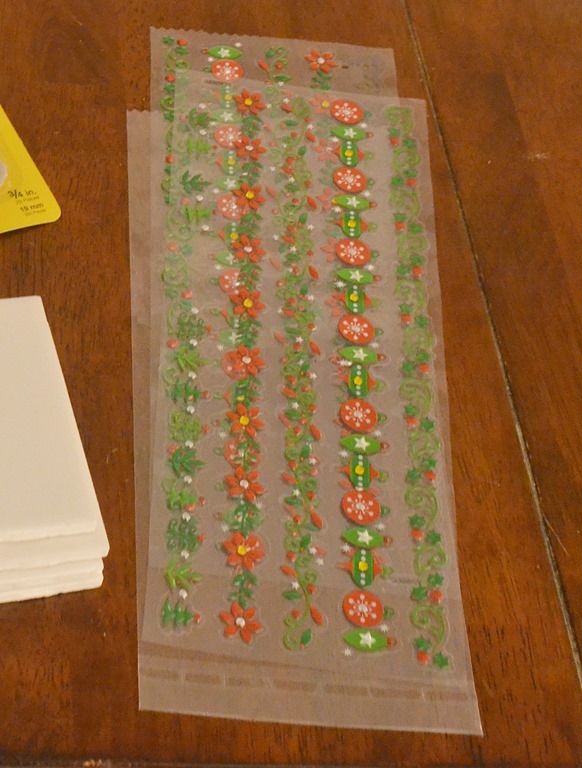 Then I went to Hobby Lobby and bought some decorative Christmas stickers, with my 40% off coupon, of course! First off, I covered each tile in Mod Podge. 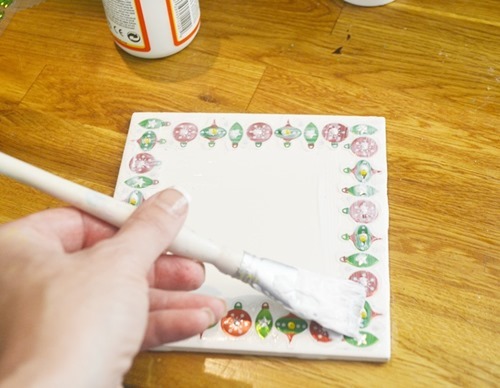 Then I cut the Christmas stickers the length of the sides of the tiles and placed them on the edges. Next, I covered then entire tile in Mod Podge and let it dry. 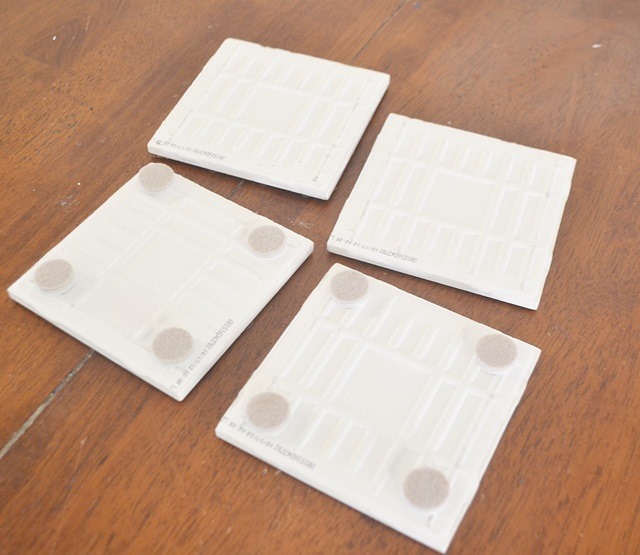 To protect your furniture when you use the tiles, just attach self sticking felt pads to the bottom of the tiles. Lastly, to seal the tiles, spray them with acrylic sealer and let dry. Then wrap them up in a bow, and you are finished! I have less than $2.00 in each of these sets of tiles. Not bad, huh? 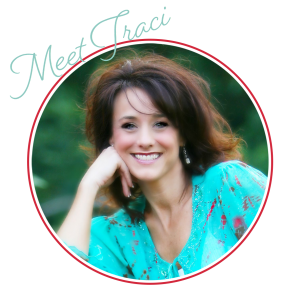 They are cute, practical, personal, and don’t forget affordable! 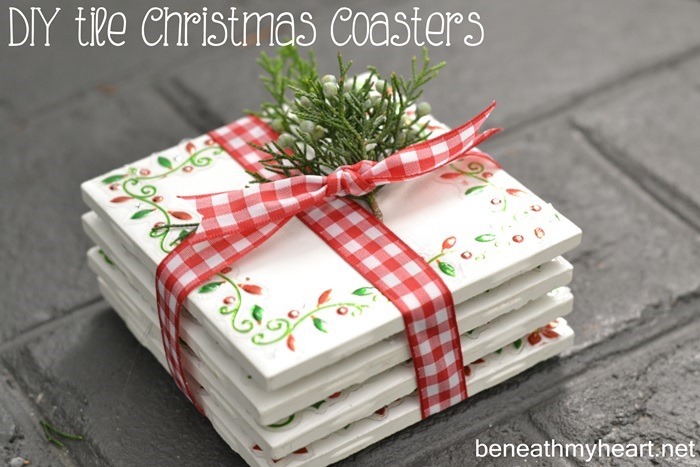 Need more hostess gift ideas? 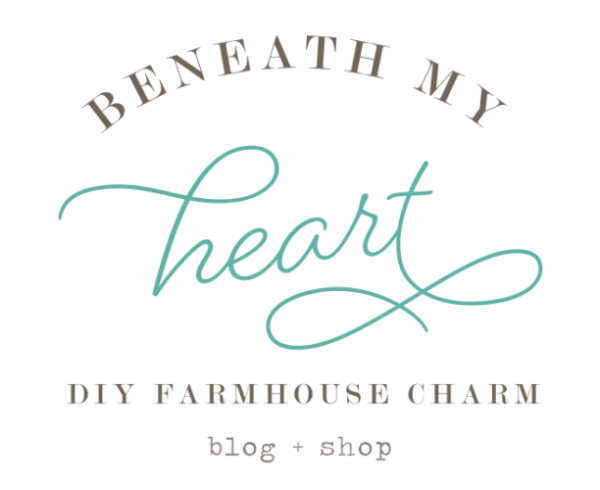 The Lowe’s Creative Idea bloggers have loads of ideas for you! 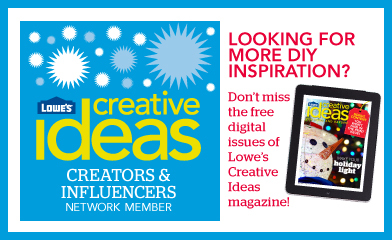 You can also sign up to receive their free Creative Ideas Magazine for even more inspiration. 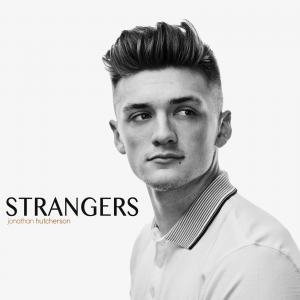 Check out their magazine app so you can have inspiration on the go! And be sure to follow Lowe’s on Pinterest or on Instagram! Disclosure: As a part of Lowe’s Creative Ideas Team, I was provided a gift card to purchase supplies for this project. I was not told what to create or write. All ideas and opinions are 100% mine! 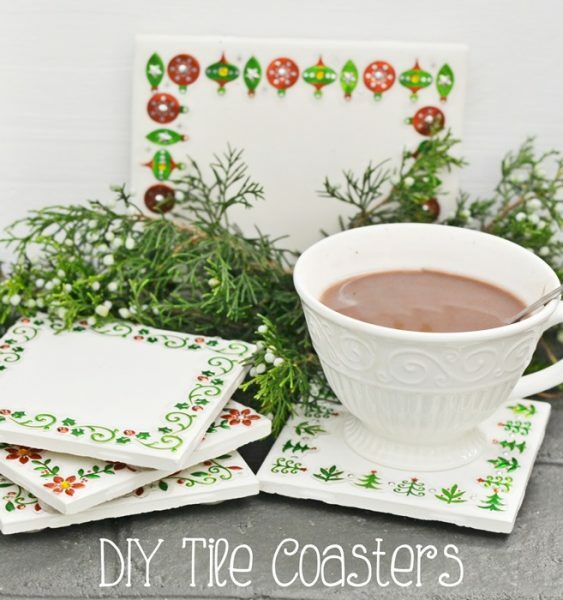 I have a few coaster projects like this pinned to Pinterest but when I go back and read the comments, most people complain about the tiles never really drying and having issues if you actually put a hot cup of coffee, etc on the coaster. Have you noticed any issues with yours? Very cute. 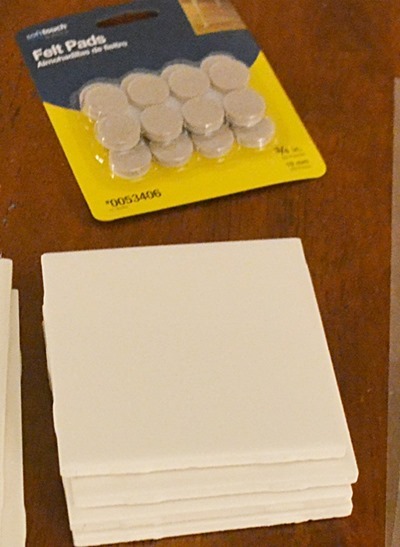 I’ll have to make some as I have so much leftover tile and felt backing that I bought in a roll. I have a set at every chair, but i never seem to have one when I need it! love this idea! Need something in expensive. 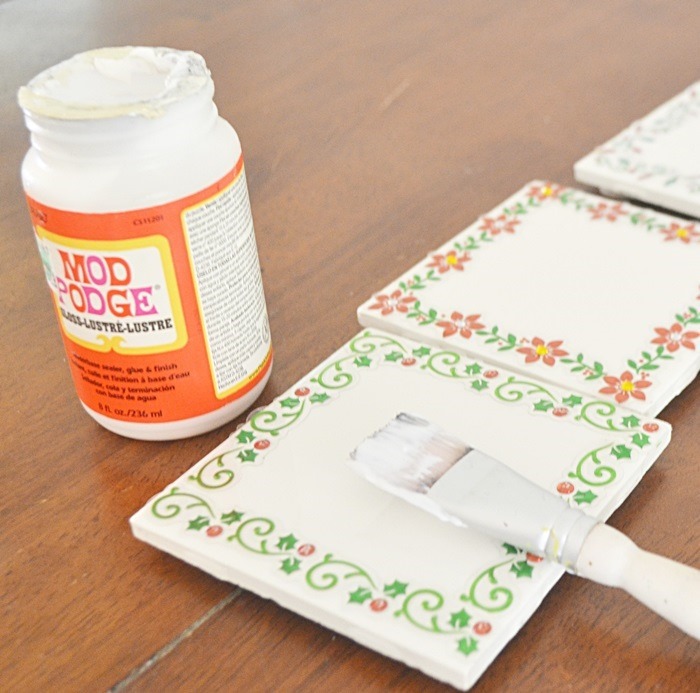 Wondering if you NEED sealer on top of the modpodge? I’ve never used either, but I was under the impression modpodge was a sealer. Any clarification? The sealer will help it stay water proof. When I do these tiles (which 200 are piled on my table now waiting for ribbons to wrap them)I use scrapbook paper in different/like patterns and the modpodge won’t make them water proof. I LOVE this project and am giving them to co-workers, neighbors, family and friends. A couple of quick questions.. do you let the modpodge dry completely before spraying the acrylic sealer? And you can use scrapbook paper too, not just stickers? This is such a great idea, thank you!! Love the stickers! I made some with my MOPS group a couple of years ago. 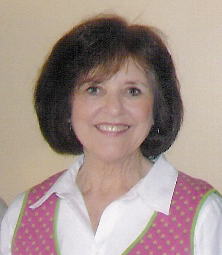 I wasn’t so happy with how they turned out – probably rushed the process. Will try again with your instructions. Instead of the little button felt pads on mine, I went to Michael’s and got a roll of cork. It’s a nice big one and was only $3.47. I could do lots and lots of coasters with this. Just cut it to the shape of the tile. Love these coasters. I never thought to use stickers. How cute is that?